It is my pleasure to welcome Francie Dillon to The Book Chook today. 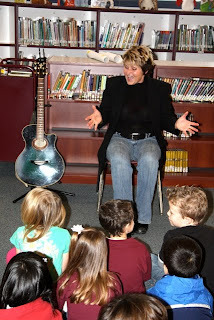 Francie’s background as a national award winning children’s singer-storyteller helps deliver her message in an entertaining yet educational way. She is currently a Professor of Children’s Literature at California State University at Sacramento; and speaks nationally on the topic of read aloud techniques and children’s literacy. Book Chook: Francie, you're a professional storyteller. That's an ancient profession! Why do we need storytellers in these modern times with so many screens available to entertain us? Francie Dillon: Storytellers deliver, with the spoken word, treasured moments, family stories, life lessons and history in a way that cannot be duplicated. Ever. Like the final catch in the football playoffs with only 3 seconds left on the board, there is no pause, hold or rewind. It is happening now, and there is no guaranteed outcome. And yet, like a pro-quarterback, the storyteller crafts the delivery of the words while combining facial and body expression in such a way that the listener “gets it” and has the opportunity to engage their minds and imagination in a way that can provide unlimited entertainment and access to a better understanding of themselves and the world around. You ask why storytelling when there are so many other forms of screen entertainment? I believe there is nothing more powerful then the screen of the mind. Having the power to imagine a knight fighting a dragon, or Brer Rabbit outwitting the sly fox taps into a part of who we are as humans. Our need to make sense of ourselves and the world around us requires time to process and imagine without the complication of someone trying to do it for us. Storytelling allows that to happen. BC: Isn't it enough just to read to kids? Why is storytelling different/better? FD: I think both are very powerful and allow the listener creative freedom to imagine. However, storytelling allows more creative freedom with the story itself. That’s part of the beauty of storytelling. There really is no right or wrong because as the storyteller you can do what you want with the story. I love re-telling The Three Little Pigs while placing myself right in the middle of the story. I can add elements like “not by the hair on my little pink snout”, and the kids will shout, “No, it’s not by the hair of my chinny chin chin!” Then I can come back and say, “Hey, I was there… that’s what they said. I know that’s not what’s in the book, but that is what happened to me!” And kids will accept my experience as what happened, and put themselves right back in the story. It’s really great fun! The creative freedom of the storyteller allows us to embellish as we wish. Storytelling is not better then reading, it’s just another fun way to spice things up. BC: What do kids get out of a storytelling performance? FD: Kids get a chance to participate on their own terms. No one is directing traffic in the brain. They get to drive the train and decide on the destination without anyone interfering. Kids are empowered that way. They get a chance to just “be” and are challenged to use their imagination in a safe environment. I also think that kids get to see a real human doing and being very human, mistakes and all. When I misplace words or get totally into the story, they can see and witness my enthusiasm, my energy and realize that they too can be expressive and demonstrative and have fun. They can also feel my emotions when I bring it down to a level of calm in order to get a meaningful point across. And most importantly, they know and can feel that I care. The eye contact, humor and heartfelt stories and songs are as real as a person can get, and the kids know I’m there because of them. They know they are important. BC: Do you have any tips for families who would like to get more involved in storytelling? FD: Yes! Because you are all already storytellers! Think about when you call a family member or best friend and you tell them the latest fun thing your child has done. That is storytelling! You are sharing an experience with another person in an expressive way, because you want them to get it ...to feel your experience. Now, think about a familiar story, like The Three Little Pigs. Visualize yourself walking along in the woods. You overhear a conversation where someone, somewhere is complaining they need to find a house to live because it’s time to move out. Now, pick up the phone and call your friend about this really bizarre experience you had in the woods and tell them what happened. Who was it, where were you, what did the place look like, and how did you feel when you saw that wolf knocking on the door of the little pig? Just play, that’s what I would suggest. Just play, because what really matters in the big picture is your desire to share an experience with your children and create memories. Your children will love that you care enough about them to put yourself in the sometimes awkward position of trying to be a storyteller, truly creating wonderful memories. BC: How about kids? How can we encourage kids to enjoy storytelling, as well as listening to stories? FD: Yes, we must continue to encourage our kids to be storytellers, even though they’ve already had plenty of practice. Just hang out in a room where kids have access to dress up clothes and listen to the imaginative stories unfold. I’ve heard stories of weddings, fire rescues and tooth fairy discoveries. Children are natural storytellers. Ask any young child with a bandage on their arm what happened and they’ll give you a 10-minute blow-by-blow description. That is telling a story. However, as children become more self-aware, it can lead to more self-consciousness, and kids can begin to shy away from public speaking. Fear of embarrassment, being told “not that way” and other barriers can dull the storytelling imagination and place a child in the position of just listening instead of telling. Sharing stories of the day around the dinner table is a great way to encourage young people to tell stories. Another fun way is to read a story aloud and then ask the child, “Well, if you were the paperbag princess, would you do anything differently?” By allowing the child to tell their side, you are encouraging them to enter the beginning phase of being a storyteller. Lastly, to encourage our children to be storytellers, we have to be willing to listen. When your children come home from school, stop and listen to their tales of the day. While they are in the tub, ask “what if” questions and really listen to the answers. Not only will you encourage your child to be a storyteller, you’ll also encourage a level of communication that will last a lifetime. Thanks Francie! And thanks to Gwen Cullen for the great photograph of Francie! http://bit.ly/c6gMeS US storytelle<wbr></wbr>r/performer<wbr></wbr>, Francie Dillon, shares tips for including storytelli<wbr></wbr>ng in family life. RT @BookChook<wbr></wbr>: http://bit.ly/c6gMeS US storytelle<wbr></wbr>r/performer<wbr></wbr>, Francie Dillon, shares tips for including storytelli<wbr></wbr>ng in family life. I love Francie's phrase - the screen of the mind. Kids ARE natural storytellers, yet we seem to rush them out of it once the "preschool days" are done. Time to rethink this, I think. I think we are all natural storytellers. Those of us who meet with success, continue it in our lives. If we meet criticism or peer jeers, then we tend to give up on it. I truly believe attending a storytelling performance is a wonderful cultural experience for a child. And incorporating storytelling into our literacy lives gives kids even more communication tools, with spin offs to reading, writing and good old havin' fun! Fantastic interview! I think it is so important for children hear that adults weren't always the readers that they are today. It is good for struggling readers to know that they aren't alone and that if they keep working at it, they will learn to love reading too. Thanks Kelly! Francie is inspirational. I can only imagine how much fun her lectures would be.